New research led by the University of Exeter suggests that rising global temperatures will increase the quantity of the key greenhouse gas methane emitted from freshwater ecosystems to the Earth's atmosphere – which could in turn lead to further warming. The collaborative study, led by Dr Gabriel Yvon-Durocher from the University of Exeter, collated data from hundreds of laboratory experiments and field surveys to demonstrate that the speed at which methane fluxes increase with temperature was the same whether single species populations of methanogens, microbial communities or whole ecosystems were analyzed. Dr Yvon-Durocher said: "This is important because biological methane fluxes are a major component of global methane emissions, but there is uncertainty about their magnitude and the factors that regulate them. This hinders our ability to predict the response of this key component of the carbon cycle to global warming. Our research provides scientists with an important clue about the mechanisms that may control the response of methane emissions from ecosystems to global warming." The report indicates that global warming may increase the amount of methane relative to carbon dioxide emitted globally from aquatic ecosystems, terrestrial wetlands and rice paddies. Methane is an important greenhouse gas because it has 25 times the global warming effect of carbon dioxide. The production of methane in freshwater ecosystems is brought about by an ancient group of microorganisms called Archaea that exist in waterlogged sediments where there is no oxygen. They play an important role in the decomposition of biomass, but rather than producing carbon dioxide, they produce methane as a by-product of their metabolism. 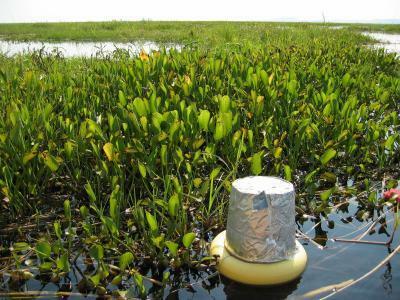 The report, published today in the leading scientific journal Nature, also showed that the temperature response of methane production is much higher than respiration (production of carbon dioxide) or photosynthesis (consumption of carbon dioxide), indicating that global warming may increase the amount of methane relative to carbon dioxide emitted globally from aquatic ecosystems, terrestrial wetlands and rice paddies. Dr Yvon-Durocher, from the Environment and Sustainability Institute at the University of Exeter's Penryn Campus in Cornwall, added: "The discovery that methane fluxes are much more responsive to temperature than the processes that produce and consume carbon dioxide highlights another mechanism by which the global carbon cycle may serve to accelerate rather than mitigate future climate change. However more research, using our results as a platform for refining Earth system models, is required to explore the consequences of our findings for future levels of climate change."